EAST STROUDSBURG — A dozen state House Democrats met with community members Tuesday in Dansbury Depot. The public forum on property tax burdens was hosted by State Rep. Maureen Madden (D-115), who plans to introduce a relief proposal later this year. Madden since 2017 has been drafting her proposal for a 50 percent average reduction in property taxes. That relief would be funded by increasing the personal income tax rate from 3.07 to 3.79 percent and imposing a natural gas extraction tax of eight cents per thousand cubic feet. That policy isn’t set in stone, though. Due to the unexpected death of a family member, Madden left Tuesday’s forum early after giving opening remarks. House Policy Committee Chairman Mike Sturla (D-96) lead the discussion in her absence. 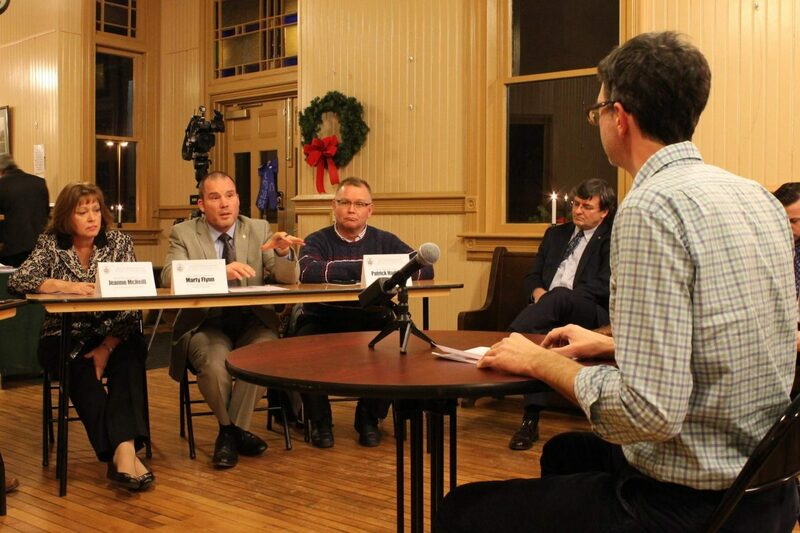 The forum featured testimonies by three local stakeholders: Stroudsburg branch manager William Cullen of Eagle Home Mortgage, Stroudsburg School Board Member Jim Burke and East Stroudsburg property investor Jane Gagliardo. Each speaker took questions from the legislators also. Those discrepancies can be a telling indicator of the home’s age, Cullen also said. Average assessment values have risen sharply since 1989, when Monroe County last completed a county-wide reassessment. Burke told legislators that current conditions have degraded both sides of the tax flow problem. Limited local control over state dollars leaves schools districts few ways to pay for public education. Most of that investment currently comes from local tax dollars. Monroe County has some of the most proportionally underfunded schools in the state. Stroudsburg, East Stroudsburg and Pocono Mountain school districts are funded less than half the amount per student that some districts in the state receive. Other residents — including Stroudsburg Borough’s Council President James Smith, Vice President Boyd Weiss and Mayor Tarah Probst — also spoke to legislators, during the forum’s public comment period. The discussion became intense at times. Tuesday’s forum was the first of what will be a series of opportunities for public input on the proposal. The date of the next event will be announced in the coming months.